I needed inspiration, and I found it in the unlikeliest of places: the post office parking lot. As I was standing there, John gently fended off a political candidate by letting him know we weren’t from around here. As their conversation broke off and John entered the post office to ship a few books, the show started. The enormous iron eagle above the post office doors came to life, flapping not quite in unison with the chiming of the clock above. 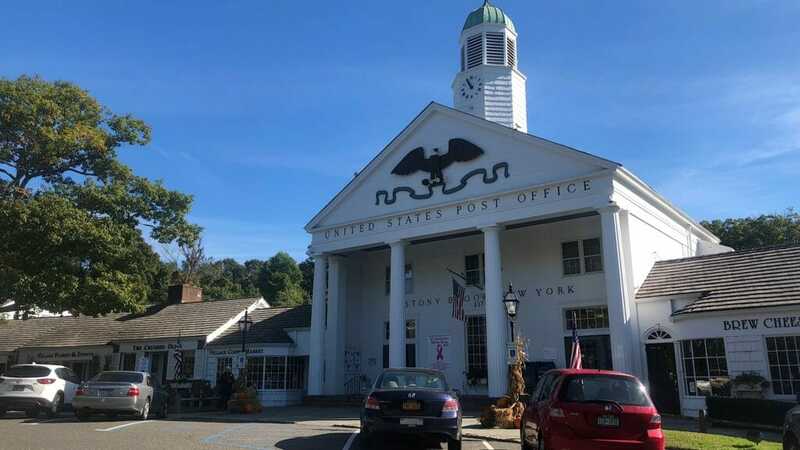 Yes, the eagle on the Stony Brook post office flaps its wings on the hour. Usually. It would have been a surprise had I not read that Stony Brook Village had an automaton. This particular journey had introduced us to what an array of mechanical wonders that word encompassed, so I steered our course to this little hamlet firmly fixed in the New England I grew up in. The other reason we’d made our way to Stony Brook was the intriguing concept of a “bicycle bed and breakfast.” While the weather hasn’t been cooperating, we’d hoped to get some bike rides in. 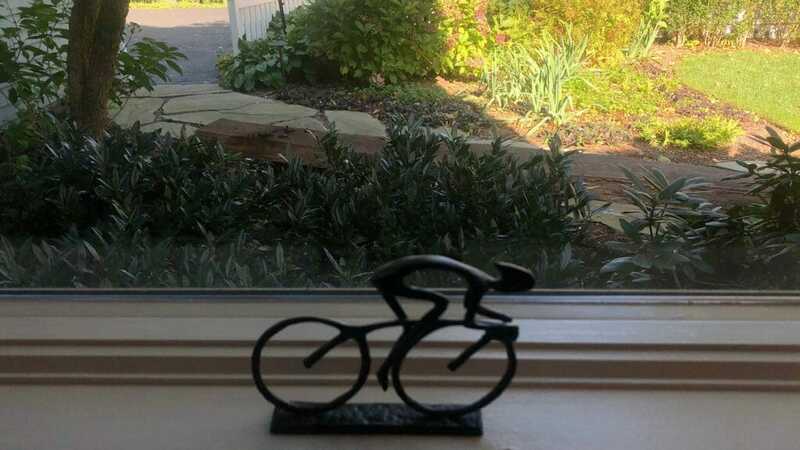 We figured staying with cyclists might help us learn how and where. Stony Brook, Long Island, has deep roots, back to Colonial times and the shaping of early America. A ring of spies in the village fed intelligence to George Washington during the Revolutionary War. 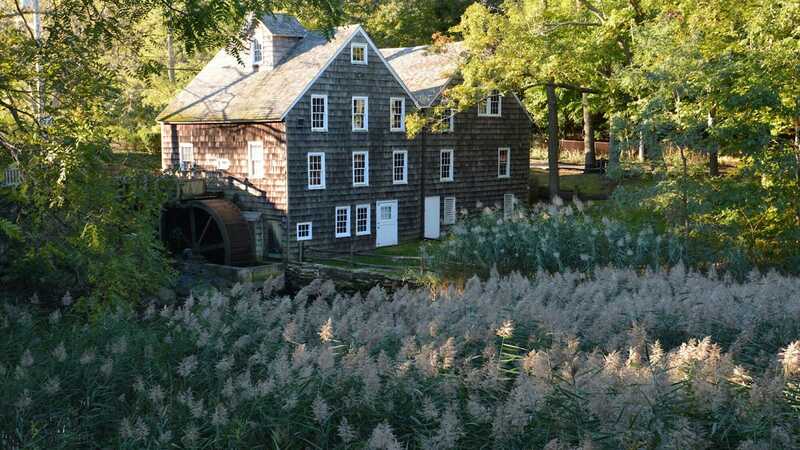 Dating to 1751, the Stony Brook Grist Mill is the most complete Colonial mill of its kind on Long Island. Our lodging, the Stony Brookside Bed & Bike Inn, sat across the brook from it. Finding the weather far too brisk for biking, we’d already treated ourselves to a parade of Americana along Long Island’s north shore, with stops along Cold Spring Harbor at Teddy Roosevelt’s Sagamore Hill, and at the surprising Whaling Museum. Now it was time to relax. Checking in, we met Elyse Buckman and her husband Marty. 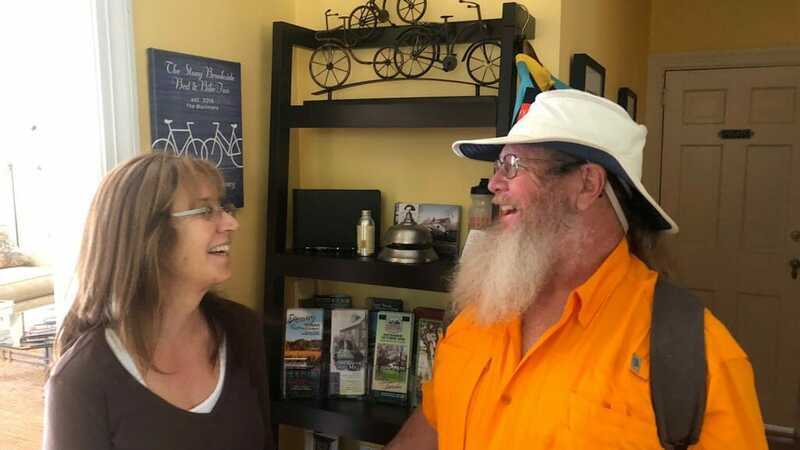 Operating a B&B was a dream of theirs; finding this particular property to create Stony Brookside Bed & Bike Inn was a perfect fit for both them and the village. “We’re just a block off the 25A bike route,” she said, referring to the primary east-west route for cyclists to tour Long Island, which is also the route of the Washington Spy Trail. She explained how many of their visitors came across the ferry from Connecticut at Port Jefferson, and a light bulb went on in my head. It is possible to visit Long Island without driving through New York City! Elyse and Marty are avid cyclists who continue to tour around the world in their off-season. We were among their last guests for 2018. It turned out we had mutual friends in Florida, and John had done some of the rides they enjoyed. We were delighted to have the Pond Room, which looked over the mill pond and Avalon Preserve, which I was eager to explore. Appreciating being able to kick back before dinner, we made use of the common areas downstairs. 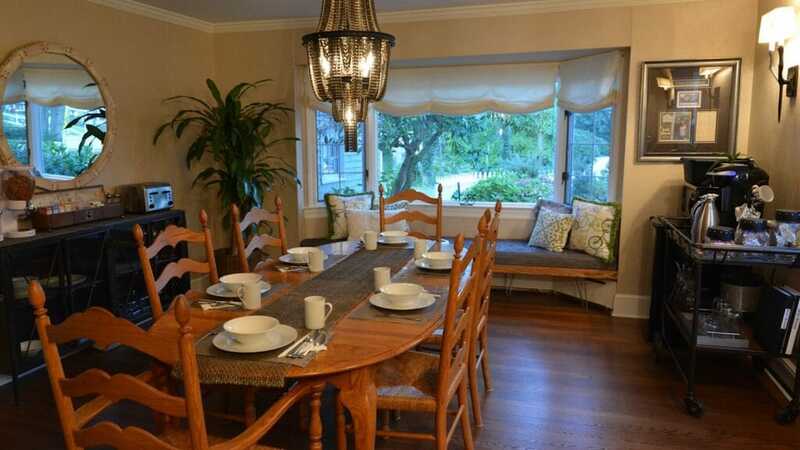 The dining room featured some creative bike-themed art, including a chandelier made of bike chains. The living room had plenty of comfy chairs and an extensive library to borrow from. Elyse spotted us and asked if we’d like some recommendations for dinner. She mentioned that our timing couldn’t be better, as the Jazz Loft would be open tonight. Neither of us had been to a live jazz session in years, so we decided to check it out. Stony Brook is walkable, so we bundled up against the cold and went into Stony Brook Village to look for some simple fare, a feat we accomplished at Sweet Mama’s. As it happened, there was live music at the bar, so we lingered a little before striking out for the Jazz Loft. When we walked in, the musicians were already into their first set, upstairs in the jazz club. The first floor is a museum devoted to jazz greats. We slipped up the stairs and settled in for the show, delighted by the talents of Rich Iacona’s “Bad Little Big Band.” The ensemble of a dozen or so played both old standards and original compositions, interspersed with Rich’s humorous patter. Between sets and after the show, we toured the museum. Jazz historian Tom Manuel founded the Jazz Loft in 2016 to preserve Long Island’s jazz history and to train young musicians in the art. 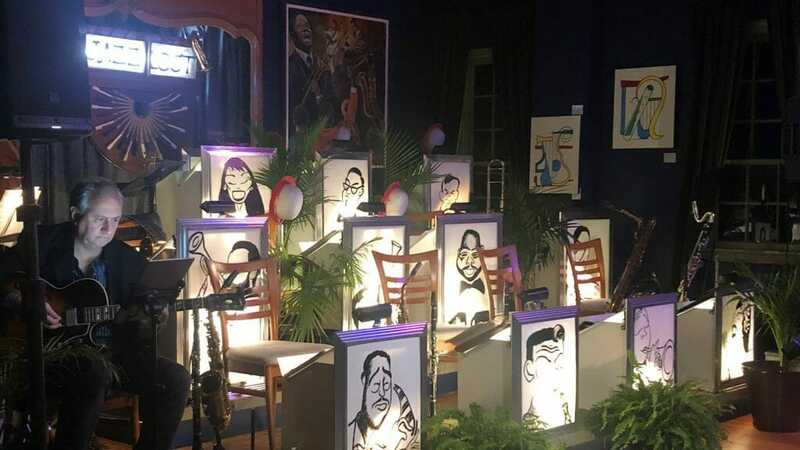 The museum has acquired some significant artifacts and collections, from a library of jazz books to the archives of Arthur Prysock to chandeliers from Harlem’s Irving Plaza Ballroom. 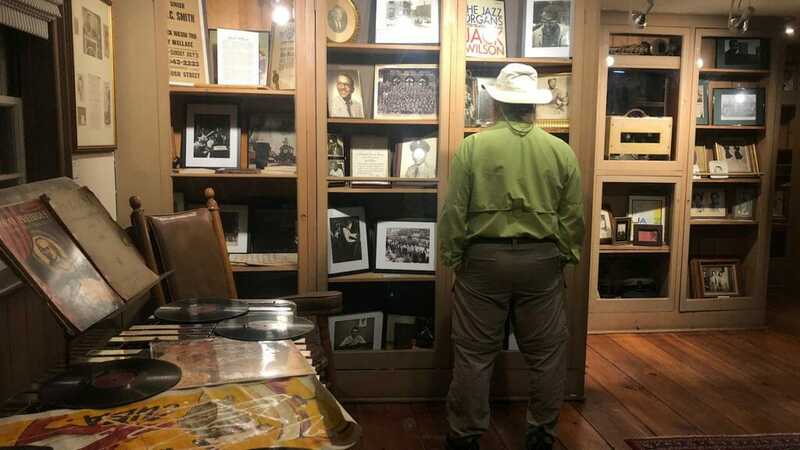 Nooks and crannies were artfully filled with photos, art, and artifacts, including an entire reconstructed mid-century modern living room from jazz great Milt Hinton. I awoke in a fog. Being the early riser, I decided to let John sleep in while I went rambling through Avalon before breakfast. It’s on the far side of the mill pond, which I couldn’t see across for the mist. Passing the mill, I found an open gate and two young men doing gardening at the crack of dawn. Avalon is both a park and preserve, and as I discovered, quite vertical. 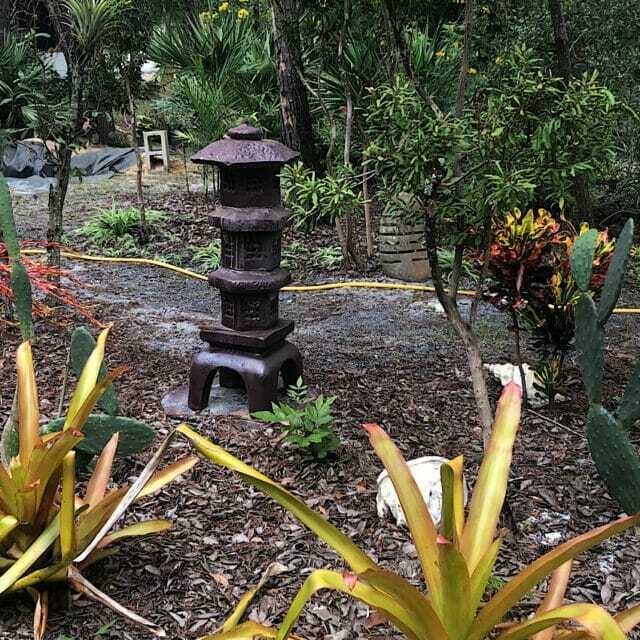 Well-manicured gardens were interspersed throughout the woodlands, which were resplendent in fall color. I followed signs towards the labyrinth, only to find it being renovated. 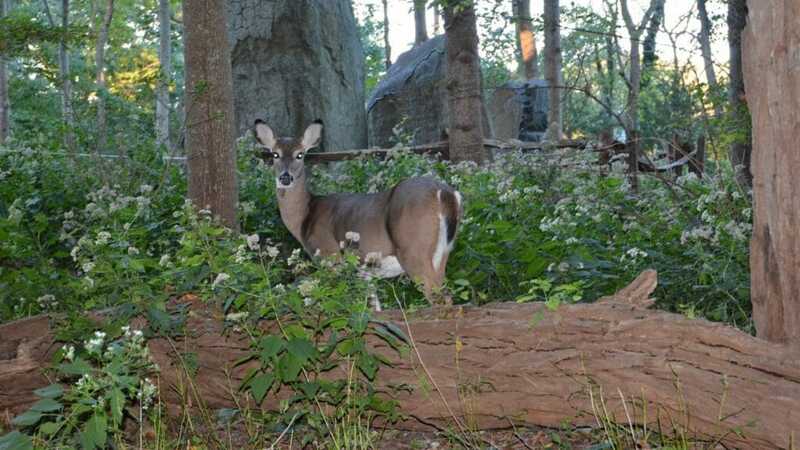 But that didn’t stop the deer from browsing there, and they certainly weren’t afraid of me. The Preserve portion of Avalon started after a road crossing. I hiked among giant glacial boulders, bringing back youthful memories of playing in the woods of New Jersey. But time was ticking away and I’d be late for breakfast if I didn’t turn around, so after completing a short loop I made my way back down the forested slopes to the Stony Brook Mill Pond. The mists had lifted, and the rising sun made the autumn-cloaked trees glow. 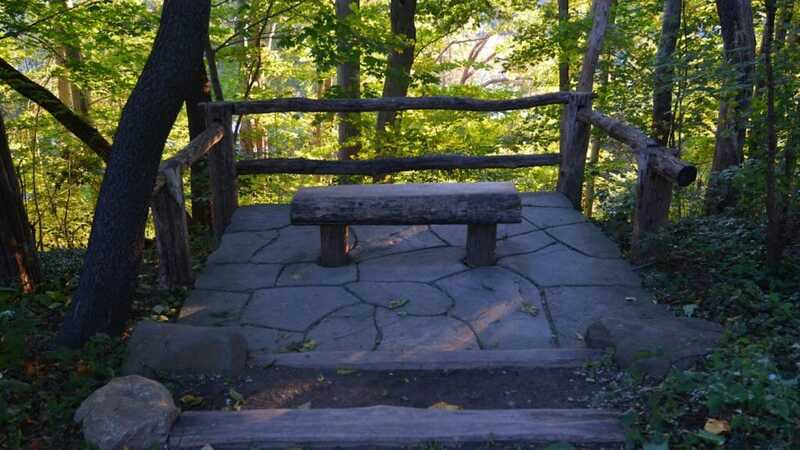 I could see how locals could spend hours reading or writing in these natural nooks above the pond. I couldn’t believe what I was seeing. It took three or four double-takes before I finally walked up to the trees and stared up into their canopies. 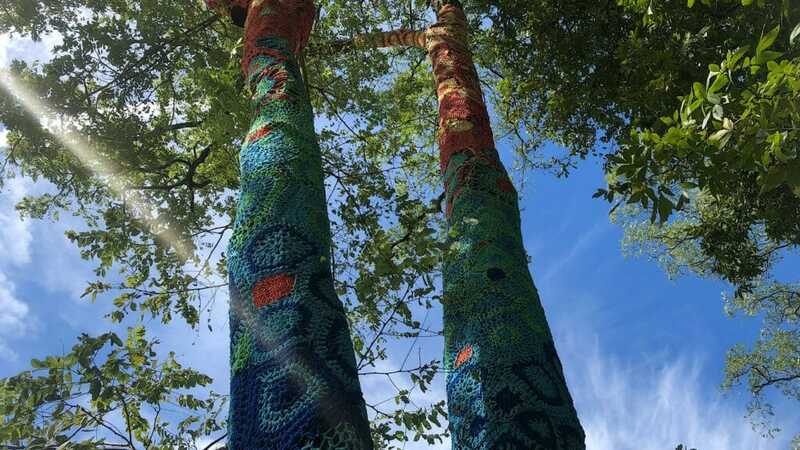 I’d never heard of yarn-bombing, but a quick online search for “crocheted trees” confirmed that’s what it was called, part of an art installation on the grounds of the Long Island Museum – and like the mechanical eagle, another oddity to be factored into the pages of my nascent novel. For quirky, the Long Island Museum can’t be beat. Elyse told us it was a must-see, especially for John’s love of vintage vehicles. Centered on what was the heart of a lumber mill in 1874, the museum grew out of a spillover of collections from the Suffolk Museum, with Ward Melville a major benefactor. The old Suffolk Museum is now The Jazz Loft. 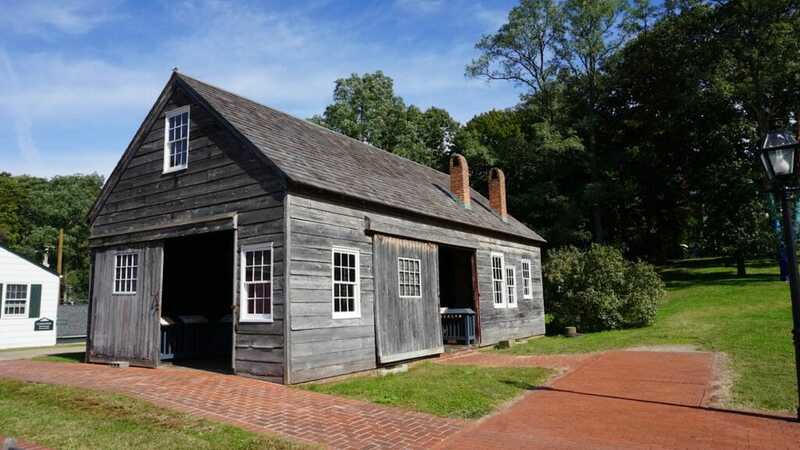 Melville’s name crops up all over Stony Brook, as he and his wife Dorothy founded a conservancy in 1939 to protect both historic structures and environmentally sensitive lands. Sensitive to how Long Island was changing with the addition of parkways, bridges, and residents, they wanted to help Stony Brook amplify its colonial character. What you see today – including what’s considered the first planned shopping center in America – is largely due to their efforts. Heir to and owner of a major shoe company, Ward had a thing for antique carriages, and Dorothy approved. It was the carriage collection that became the tipping point to build a new museum. The three story carriage museum is the centerpiece of this campus of museums, with two stories of it hidden underground. But inside, what a parade of conveyances! Eight thematic galleries showcase the grandest of horse-drawn carriages from around the world, covering everything from utility to royalty. It takes a couple hours just to see it all. 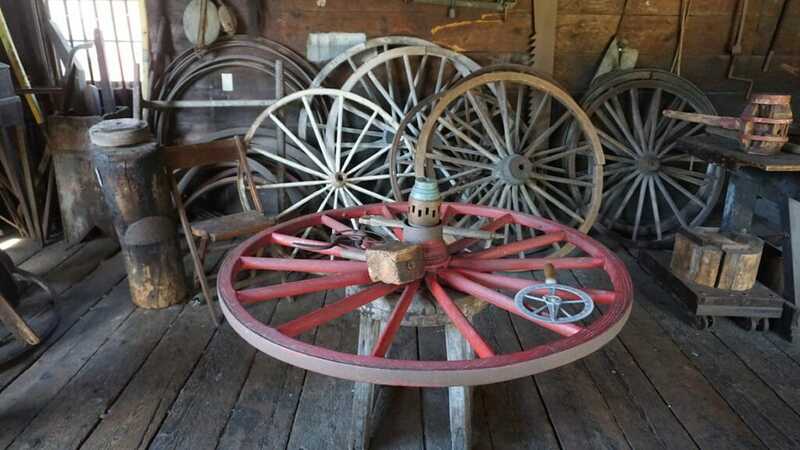 Along with an original blacksmith shop and a historic cemetery, two other museums and an art center make up the sprawling campus, which looks like a homestead on the edge of town. Inside the art museum, an intriguing display of Colonial silversmithing was in progress. The history museum was where we’d first entered, finding rotating exhibits on the 1964-65 New York World’s Fair (which I attended!) and Robert Moses, the father of parkway architecture, as well as a permanent display of carved decoys traditionally used along Long Island’s bays. Stony Brook surprised us. We didn’t expect to find so much in such a compact place. Thanks to the intriguing carrot of a bicycle-friendly B&B, we discovered a charming slice of New York that we’ll have to return to: with so much else to see and do on a overnight stay, we never did fit those bike rides in!